This pillow is designed for you to be able to tandem nurse your multiples throughout the day and night without assistance. When the tiny newborns come home from the hospital, you could actually balance two at a time on a Boppy pillow! However, it is still not easy to use both arms to make sure the babies are safe. Breastfeeding can be a beautiful experience especially if you have the right equipment. 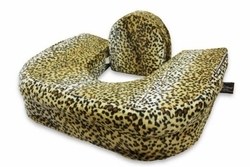 Luckily, there are great pillows to help you and your baby feel comfortable while breastfeeding. The EZ-2-Nurse double nursing pillow, and single pillows are must haves for breastfeeding moms. This is the only pillow to comfortably nurse one or two babies at a time. You can use it for bottle-feeding too!